If you’re considering remodeling your master bathroom and love a spa look, we’d love to help you plan with a few images to consider. 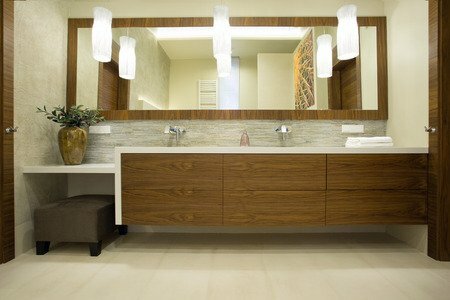 We’re starting with a bathroom that is minimalistic in color and material. In this room, all-white tile is used throughout and the result is very stark. When enjoying a spa experience, think about everything included to make a comfortable environment. Color, texture, lighting, scent. What do you think is missing in this space? Critiquing images you find of other bathrooms will help you define what you want in your own space. In this bathroom, even though the picture only shows the sink and counter, it feels very spa-like. Notice how it demonstrates the power of color through the pops of coral in the towel and the greens in the plants against the neutral white and tan of the vanity. Bringing the elements of nature into a spa bathroom is essential. Think about what you can do with hard finishes. Include natural stone and wood-look tile in ways that complement each other and bring a feeling of warmth into the space. 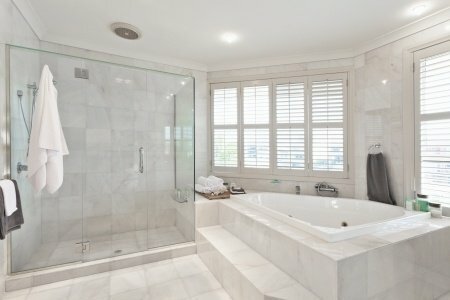 Think outside of the box when planning your bathroom and look for ways to create unique surfaces you might otherwise not think of at first. This third bathroom pulls a few colors together beautifully with the hard finishes. The white counter and lights provide an airy feel to what otherwise might look too dark with the medium toned wood cabinets and mirror frame. The grey backsplash provides the element of stone and brings another color in to play. Depending on your preferences, adding some color or pattern with towels or the upholstery of the ottoman would help enliven this space a bit more. While décor tastes are subjective, spa looks are successful if they include materials and décor that connect you with nature. Carefully considered balance of colors and well-chosen lighting add to the sense of warmth and comfort. Think about the colors and materials that offer this experience for you. We’d love to help you make these important decisions at Conestoga Tile by helping you choose the materials that are right for you. Don’t forget include room fragrance using essential oils or natural ingredients, the softest towels you can find, candles, plant life, and enjoy your in-home spa experience!